An intriguing suspense story. 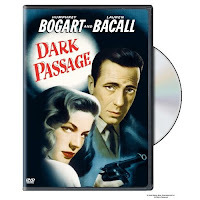 Vincent Parry (Humphrey Bogart) is a man wrongfully convicted of murdering his wife. He escapes from San Quentin in an attempt to prove his innocence. He is picked up by a man who realizes who he is when the bulletin about his escape is broadcast on the news. He knocks the man out and is then picked up by Irene Jansen (Lauren Bacall). She has followed his trial in the papers and does not believe he killed his wife. She offers him safe harbor in her apartment while she attempts to help him. While he is in her home he realizes that she is friends with Madge Rapf (Agnes Moorehead) - a woman who was entangled in his life before his wife's murder. Now he suspects that she is trying to weasel her way into Irene's life like she did his. He decides to undergo plastic surgery to change his face but will it be enough to save him? And will he be able to prove his innocence before it is to late? This was a very good movie. Bogie and Bacall had wonderful chemistry like they always had. The interesting thing is that we do not see Vincent before the surgery takes place. The entire first part of the movie is shot from his point of view. It is a wonderful way to put yourself in his place. A very good movie that does not seem to be remembered as much as others.